“The Calling” focuses on Jinora, Ikki, and Meelo as they take on the task to find the Avatar. The airbending kids receive some valuable character development in their first major appearance as a team. Ikki, in particular, shines as the hyperactive middle child who finally gets her siblings to take her seriously. The trio’s journey takes a lot of cues from Avatar: The Last Airbender, as is their intent. Jinora, Ikki, and Meelo spend the episode traveling to various towns via sky bison and getting into light-hearted antics along the way. Even a serious moment where Ikki is captured by members of Kuvira’s army is made funny when she befriends them, repeatedly lifting her hands out of her restraints a la Aang in “Avatar Day”. The children’s petty squabbles put a damper on their mission, but they ultimately strengthen their sibling bond. 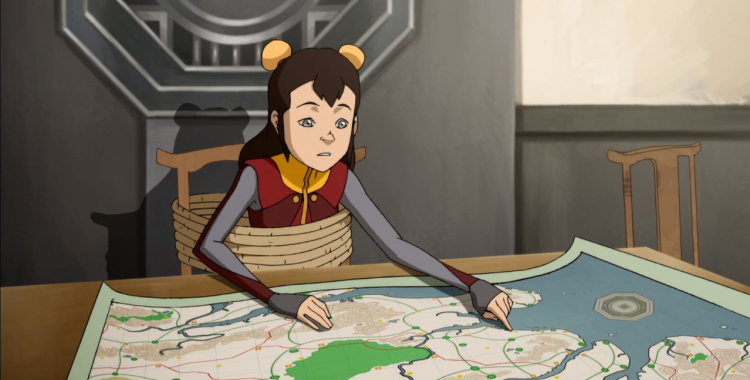 Jinora, Ikki, and Meelo are all different from one another, but Korra does a good job of highlighting their strengths. Jinora’s spiritual power is what leads them to Korra, but Ikki’s gut feeling concerning her location gets them there in the first place. Add in Meelo’s lust for battle and you have a pretty well-rounded trio. 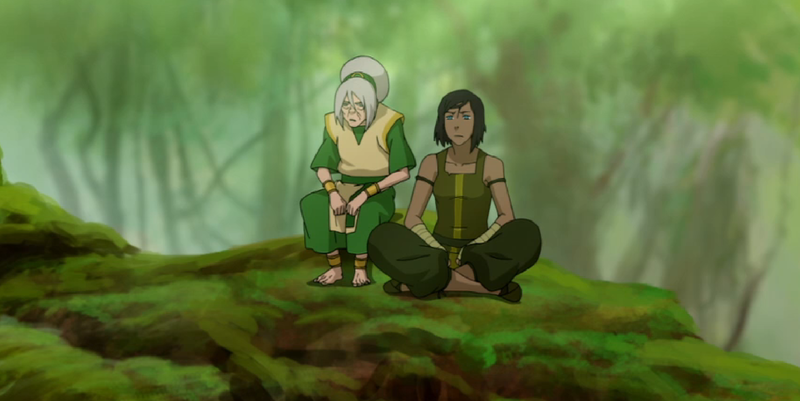 While the airbending kids look for Korra, she receives some much needed advice from Toph in the swamp. Toph is a lot more helpful in “The Calling”. Rather than tease Korra for her own amusement and offer cryptic advice, Toph forces Korra to confront her fears. She suggests that Korra can learn from her enemies, as none of their ideas are necessarily bad ones when constrained within reason. That idea has a balancing effect on Korra, who is able to let go of her fear. From then, it only takes a brief trip to the heart of the swamp (which is, as predicted, the same swamp that Toph first appeared in as a vision to Aang) to re-open Korra’s senses, which leads Jinora right to her. As soon as the kids inform her of Kuvira’s plan, Korra bends the remaining metal poison out of her system and hightails it over to Zaofu. Recovery effectively complete. “Enemy at the Gates” both follows up Korra’s return and catches up with some of the other players in the brewing conflict. Having “united” almost every nation in the Earth Kingdom, Kuvira sets her sights on her own hometown, Zaofu. Kuvira knows she’s not welcome in Zaofu, so she decides to use Bolin as an emissary. Bolin’s good natured attempt to win over Suyin and her family backfires when they make some alarming allegations about Kuvira’s operations. Suyin’s claims of forced labor and “re-education camps” plant the seed of doubt in Bolin’s mind, which blooms into full-scale fear when he is threatened by Kuvira for his wavering loyalty. Similarly threatened is Varrick, whose attempts to create a spirit vine energy weapon fail so spectacularly that even he begins to doubt the sanity of the operation. Bolin, Varrick, and Zhu Li come to the mutual conclusion that they’d rather not work for Kuvira any longer and attempt to escape, only to be recaptured by Kuvira’s minion/fiancee, Bataar Jr. after an appropriately epic battle. 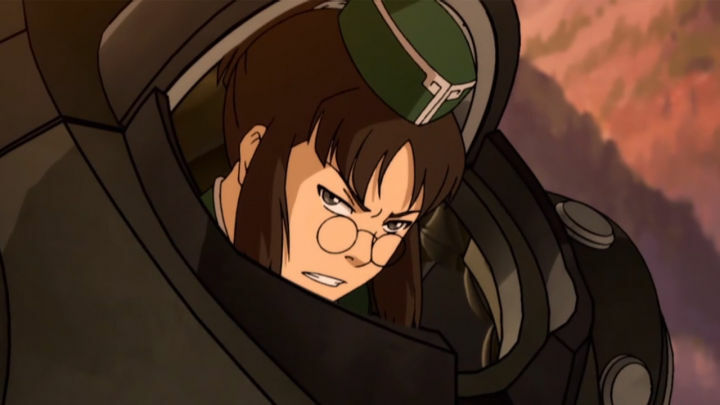 Zhu Li, who is a notably skilled fighter, throws herself at Kuvira’s feet and spins a tale about being forced to defect by Varrick. Her rant is convincing, but I doubt it’s genuine. As legitimate as her accusations at Varrick are, Zhu Li doesn’t seem the type to betray her employer. It’s more likely that she’ll act as a double agent. Kuvira, usually preoccupied with appearing fair and reasonable, seems to have a sore spot concerning Zaofu. 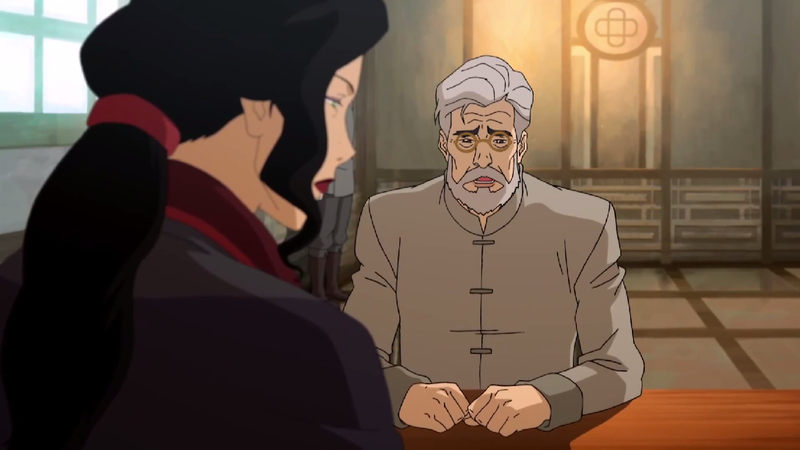 Her relationship with Suyin was formerly familial, and I wonder whether their soured relationship has as much to do with her overzealous decision to invade Zaofu as her desire to unite the Earth Kingdom. Korra’s arrival to Zaofu signals a turning point in the conflict. Upon meeting Kuvira for the first time since her recovery, Korra is almost convinced by Kuvira’s words. They really are two sides of the same coin, with Korra being easily taken in by Kuvira’s claims about “making the hard decisions”. I doubt Korra will truly be swayed, but her newfound attempts at diplomacy hint at a new Avatar, one who recognizes that she can’t just punch her way out of a situation (even if she will have to punch her way out of this one, at least according to Meelo). Back in Republic City, Asami decides to reconnect with her incarcerated father, Hiroshi. While not directly relevant to the plot, Asami’s decision to try and forgive her father is one that could have future implications. I hope that Hiroshi’s desire to make amends is genuine, but his reappearance is suspiciously sudden. Asami is one of the smartest, most level-headed characters in The Legend of Korra, and I’d hate to see her get burned by her father again. As “Enemy at the Gates” demonstrates, the situation is escalating in the Earth Kingdom, and with Bolin on his way to a “re-education camp”, I expect that we’ll see the negative repercussions of submitting to Kuvira’s rule soon enough. As for Suyin, she may find herself in over her head with her decision to infiltrate Kuvira’s camp. Hopefully Korra will be able to alleviate the situation before things completely go south.